In June 2012, Government and International Relations Professor Sue Peterson, post-baccalaureate research fellow Lindsay Hundley ’12, and undergraduate Ben Kenzer’ 13, travelled to the British International Studies Association and the International Studies Association Joint International Conference in Edinburgh, Scotland to present their joint paper, “The Rise of China and the Academy.” Their project draws upon data collected by the Teaching, Research and International Policy (TRIP) Project at the Institute for the Theory and Practice of International Relations to answer the question of how scholars respond to real-world trends in international politics. The project found a significant disconnect between the geographic regions scholars perceive to be most important to world politics and the areas they choose to teach and research. While large percentages of IR scholars around the world report that East Asia is of growing strategic significance to their home countries and that its influence will most likely increase in the future, only about one-third of scholars devote at least one class period to teaching East Asia in their undergraduate courses, and only about 12 percent of all articles in the 12 leading international relations journals are devoted at least in part to the study of the region. These results suggest a significant gap between the academy and the policy worlds, which limits the ability of the academy to speak to the full range of policy-makers’ research needs. As an undergraduate, this was Kenzer’s first experience at an academic conference. "Attending BISA with Lindsay Hundley and Professor Peterson presented a wonderful opportunity to share TRIP data to a global audience,” said Kenzer. “Our findings are quite striking, and it was really engaging to discuss our methods, data, and opinions to a large, academic crowd." 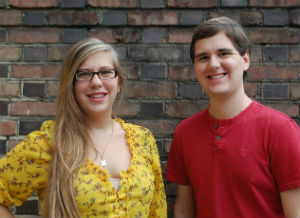 Lindsay Hundley and Ben Kenzer, both International Relations majors, joined the Institute as fellows for the Project on International Peace and Security in 2010-11 and now work on TRIP. Hundley graduated in 2012 and is a post-baccalaureate research fellow working as a project manager while Kenzer, still an undergraduate, works as a TRIP research assistant. The team is now working to extend the article to include the most contemporary data on China and will also examine the academy’s response to major news events like the collapse of the Soviet Union in 1989 and the terrorist attacks on the United States on September 11, 2001. TRIP is supported by the Institute for the Theory and Practice of International Relations which works to produce ground-breaking empirical data, support student-faculty research collaborations, contribute to international relations policy debates, and enhance the intellectual climate at William & Mary. Sue Peterson is the Wendy and Emery Reves Professor of Government and International Relations and Director of the Institute for the Theory and Practice of International Relations.